Remember when I posted my favorite diet foods for 2008 and I mentioned that despite loving all the foods/recipes I post to my blog, there are times when I wish I could add a special mark to make sure you don't miss them? Well, today is one of those times, as these chocolate covered wafer rolls are the new found love of my food life. They are beyond delicious and if they sound remotely interesting you definitely should seek them out and try them! What are they exactly? Well, they are basically like pirouline rolls (round crispy/flaky wafers), except these are different in that they are coated inside with a thin layer of chocolate and then covered with an even more perfect layer of dark chocolate around the outside. The outer layer of chocolate is deliciously thick (*much* thicker than you'd imagine) -- in fact it is so thick, that it is hard to believe that two of these dark chocolate covered wafers are only 120 calories!! The full nutritionals for the dark chocolate flavor are 120 calories, 6 grams of fat, 1 gram of protein, and 1 gram of fiber -- so they 3 weight watchers points for both or 1 weight watchers point for just one (which is quite satisfying and filling on its own). I ADORE dark chocolate, since it not only fulfills my chocolate cravings, but it is also known to be more healthy than milk chocolate, since it has antioxidants in it, which are believed to help lower blood pressure and protect against heart disease. The wafer rolls also come in milk chocolate and peanut butter for 10 more calories. All of the flavors are all natural, and do not contain hydrogenated oils, artificial flavors or colors, high fructose corn syrup, or preservatives. 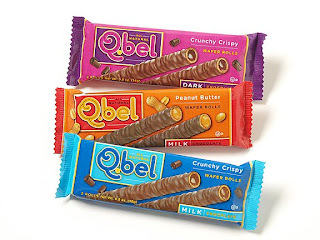 I found these QBel wafer rolls hiding amongst all the giant chocolate bars at whole foods, and I'm so glad I did!! Do they have any flavor besides chocolate? I'm allegic! They sound delicious. But how can you eat just one?! The peanut butter flavor sounds good!Are they vegan? ?I used to love wafer rolls filled with chocolate! You should start posting the food items' picture so users can see the siz of the wafers, say, compared to a dollar bill or pencil. It would help many of us gauge the portion size! Thanks for a great blog! Thanks for the suggestion -- the wafers are about 4.5 inches long. I know this is an older post but I tried these on your recommendation....yummy! I'm on WW too and the only problem I have is eating just one package. It's totally worth it for 3 points as long as I can stick to the one package. I wish they were sold on Amazon! Thank you, thank you, thank you!!! I LOVE these! Is it cheating if I have one in the morning and one in the evening so that I can count it as two points instead of three? What's so cool is that this company is right here in Nyack, NY! We're practically neighbors! I bough a whole box of these from my local Back to Earth. Totally yummy!